The Contour is a large, well made rucksack at an affordable price with ample space, comfort and support. using the Vango contour on a training day. 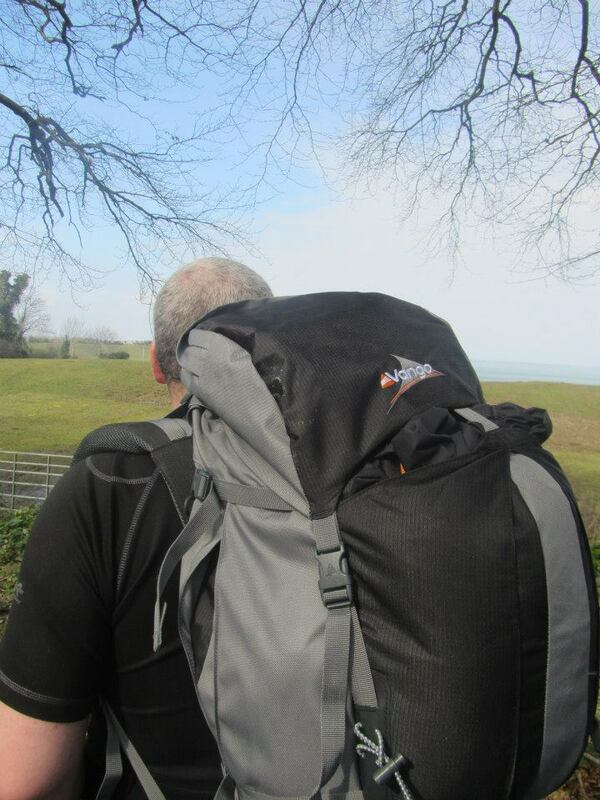 For over four months I’ve been using the Vango Contour 60 plus 10 rucksack. 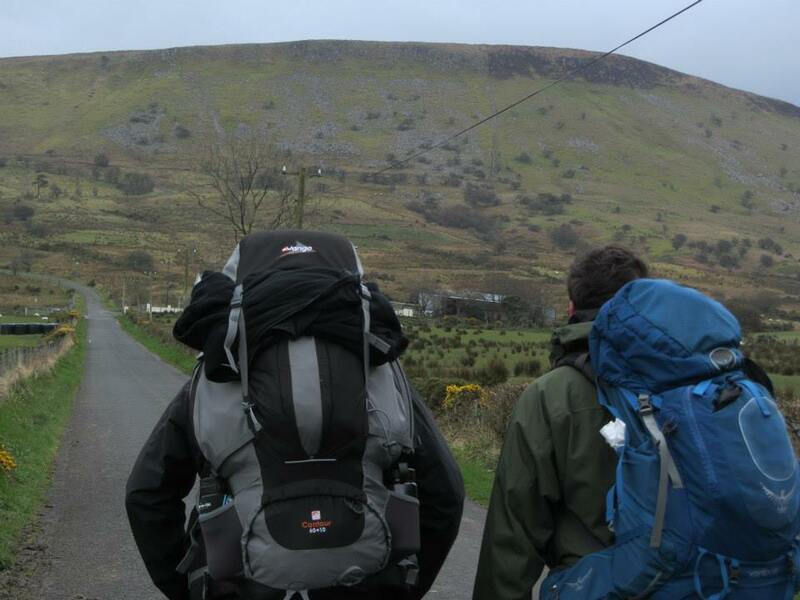 My introduction to using this rucksack was during our training walks for the Sperrin Way. 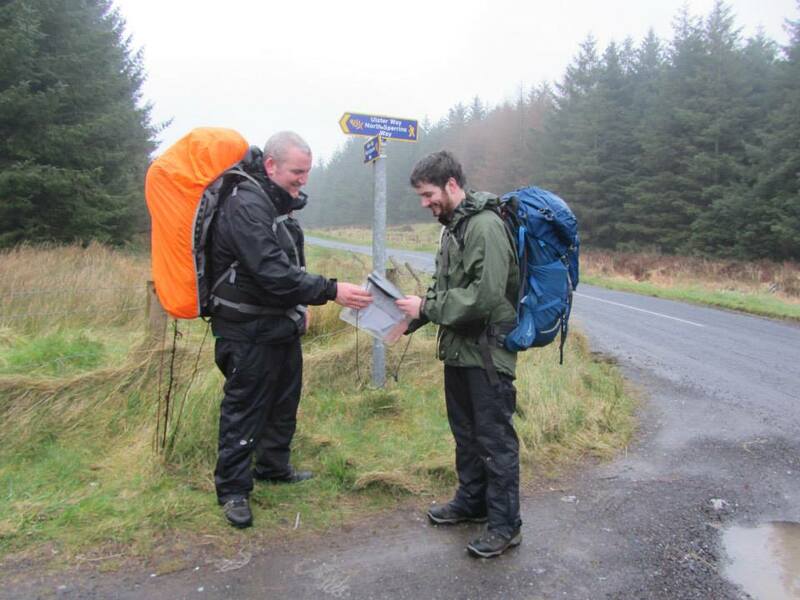 My first proper test using the rucksack was on a 40 mile trail on the Ulster way which leads over the Sperrin mountain range in Northern Ireland. My first impression of the Contour was that it had a simple but effective design. 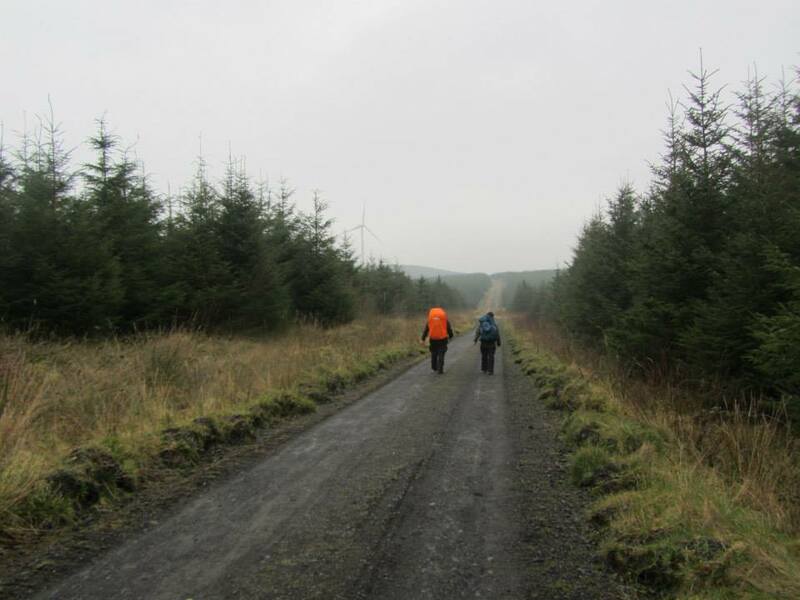 Trekking across the Sperrins using the Contour. The Contour rucksack can be adjusted to allow an extra ten litres of storage for additional items, such as winter kit. The Contour has a zipped divider, which splits the main compartment in two and has top and bottom access using robust zips. 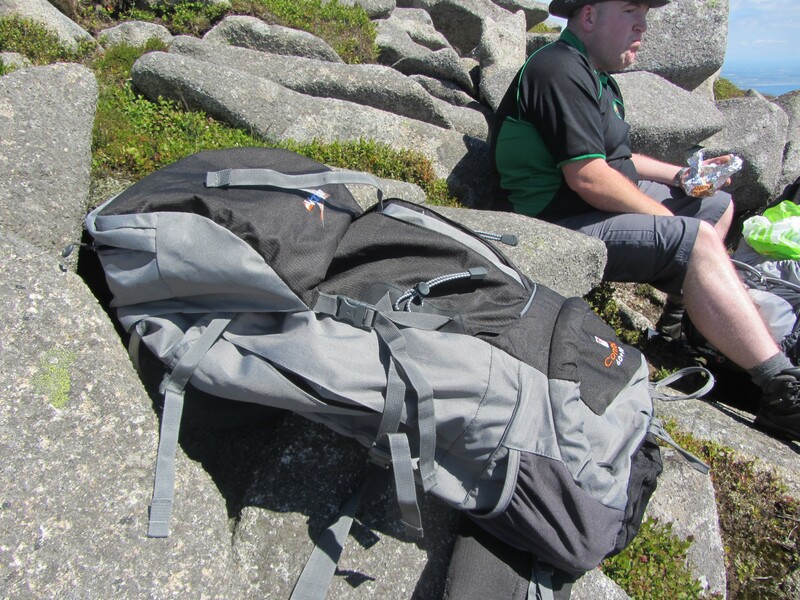 In recent years Vango’s backpacks have been fitted with adjustable back system (Quick adjust carry system) with an alloy frame for distribution of weight. The Contour can be fitted to the hiker’s own back by simply measuring from the base of the spine to the nap of the neck then translating the measurement to the pack. The two main straps are also fitted with mesh for a more comfortable fit. Another nice feature with the Vango Contour is the detachable rain cover in the base of the pack which also aids visibility in low light. The reflective strip comes in useful in poor visibility. rain cover attachment in base. Like most modern backpacks the Contour is hydration pack friendly with a pouch to store the bladder pack and a port for the drinking tube. 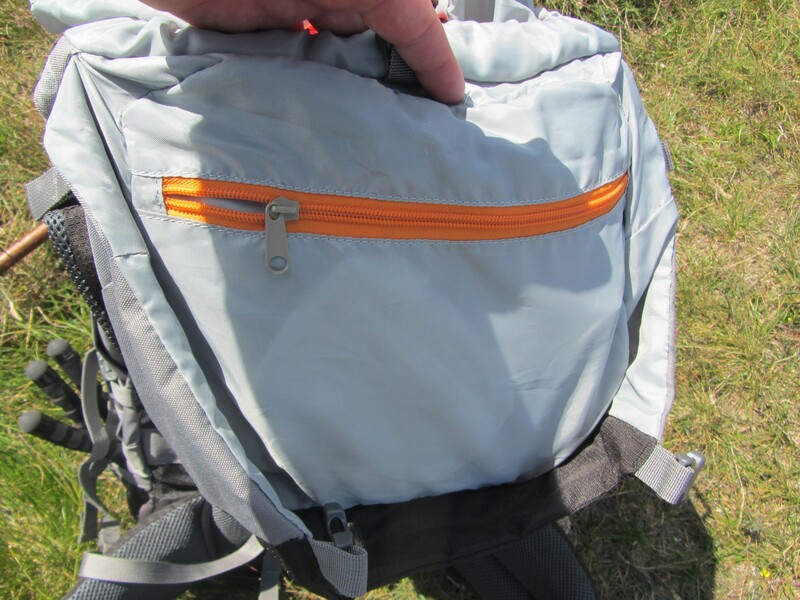 A bright orange clip secures the bladder pack in place within the pouch. 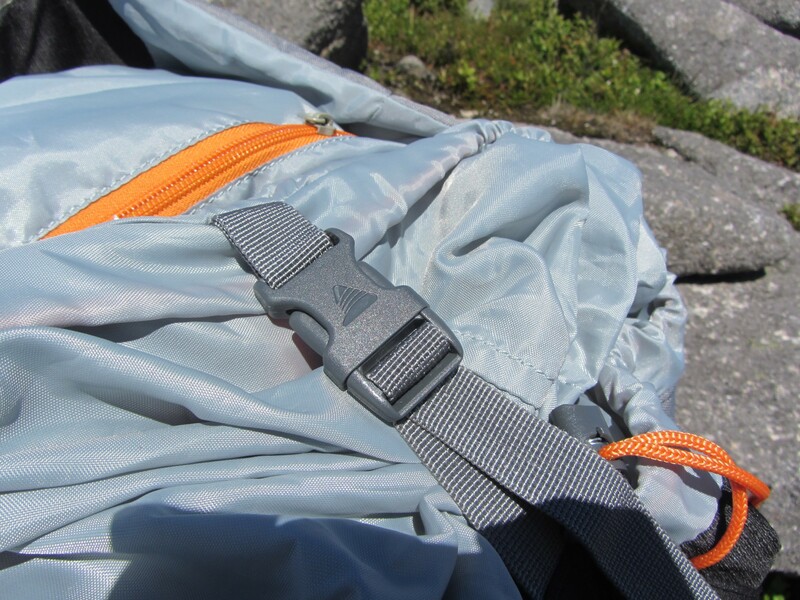 compression straps to secure items or compress load. 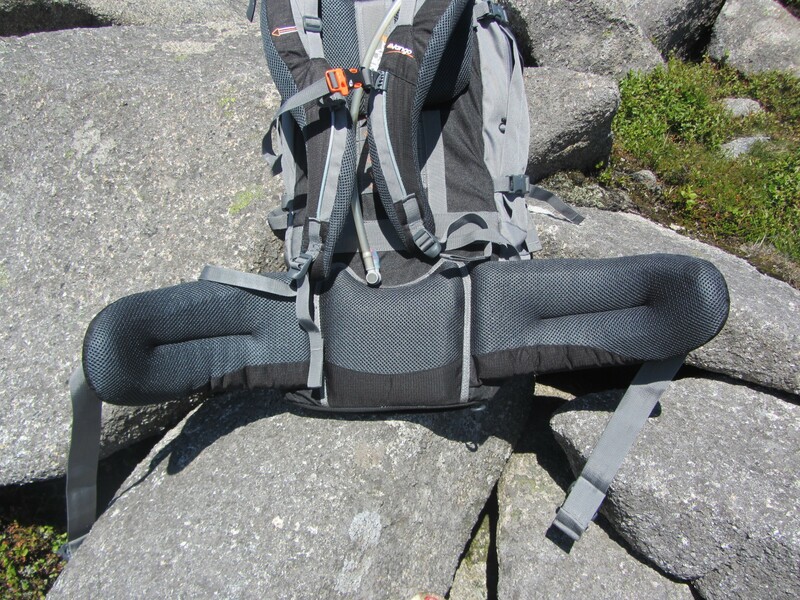 The Contour’s hip band is well padded and helps disperse some of the pack’s weight evenly on the hips. I found the Contour’s material to be very robust, the back is constructed of 600 polyester and the bottom is 1680 polyester. 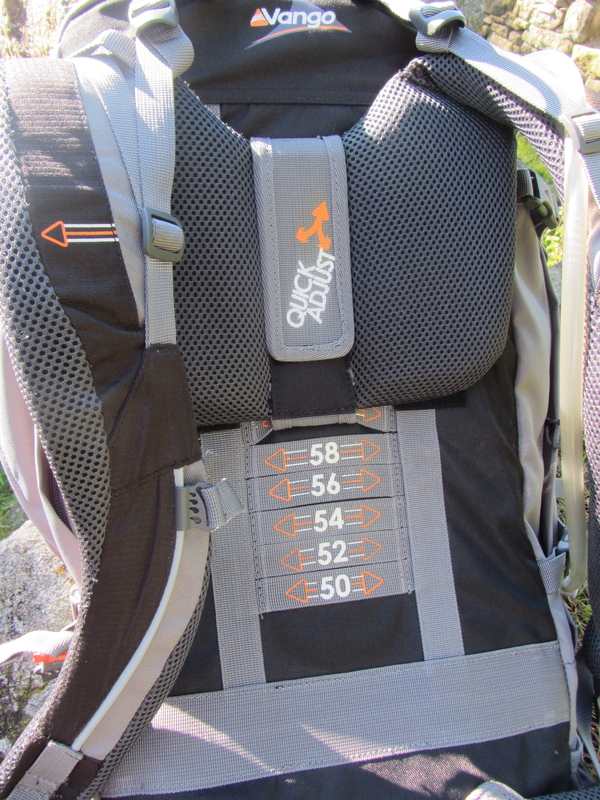 The compression straps fitted to either side of the Contour can be adjusted to allow more space within the pack or to attach items such as hiking poles. 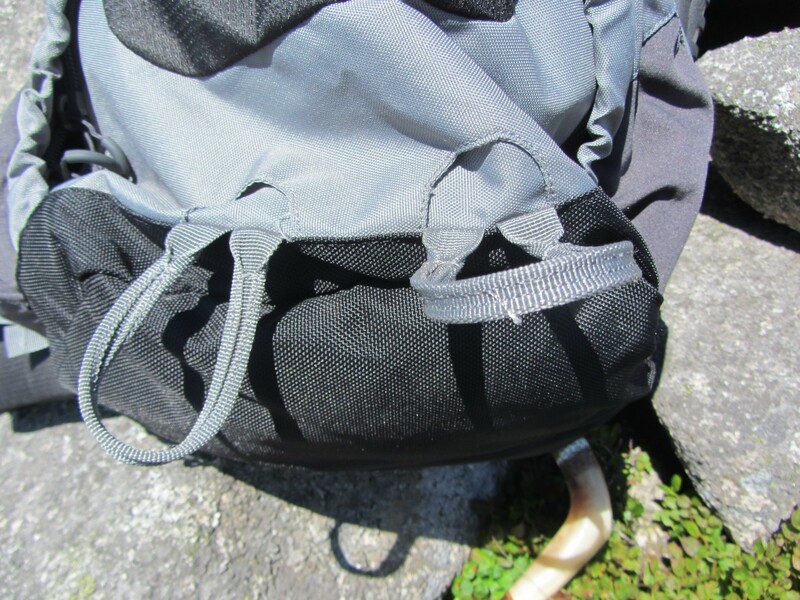 This backpack is fitted to allow ice axes to be attached. I found the zips to be very robust and easy to use. 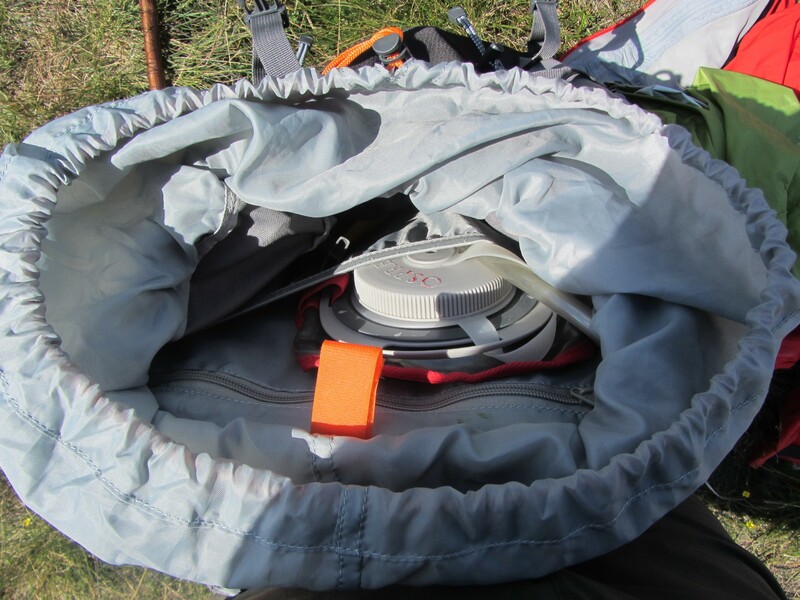 At 2.54kg the Contour is not the lightest pack available. This seems to be the main drawback of quality featured packs within this price range. 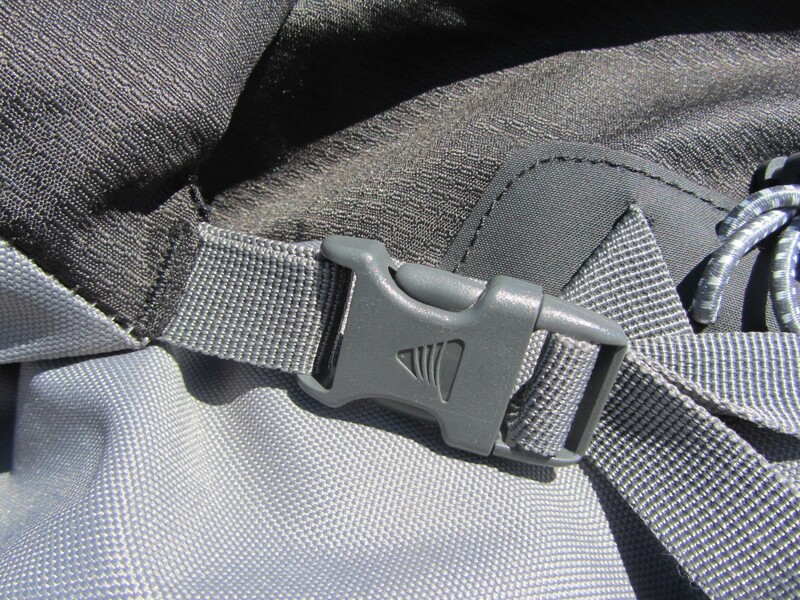 The top lid access has a twin buckle closing with a double pull cord. The Vango Contour 60 plus 10 is endorsed by the Duke of Edinburgh award scheme and recommended for expedition use, although a 50-litre pack would most likely be enough for a bronze award expedition. Handy wand pockets to each side. The Contour is a large quality backpack at an affordable price with enough space, comfort and support. Its only real drawback is weight – which is comparable to other rucks in its class. Lift up the main hood and you’ll find a handy zipped pocket which is ideal for storing such items as keys or a wallet. 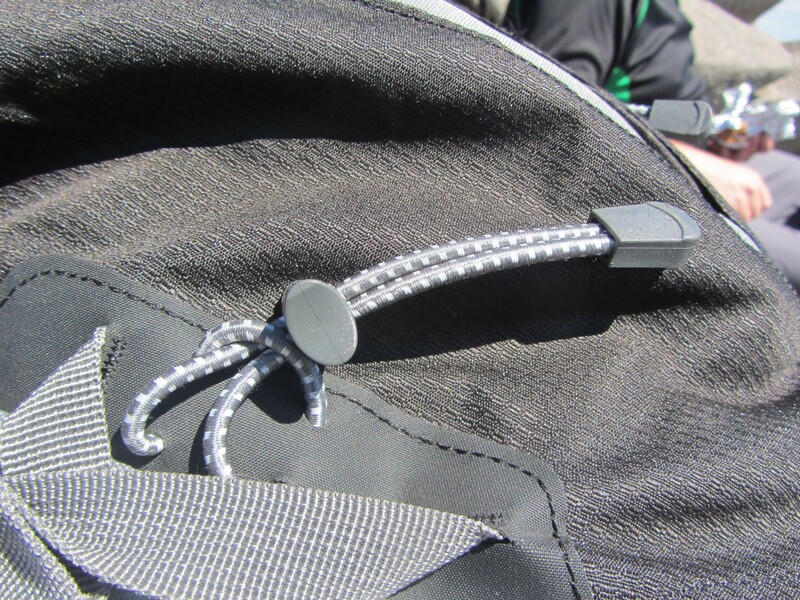 A double pull cord secures the main compartment with a compression strap which clips under the hood, helping pack down some of the bulk inside the rucksack. compression strap to bulk down load. 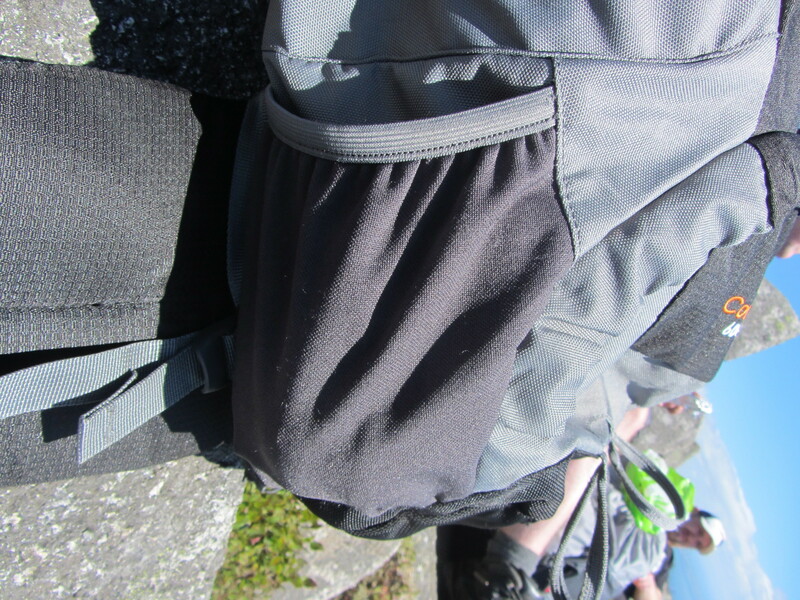 A nice addition to the Contour is a front pouch which is enclosed under the hood when it’s shut, I found this pouch great for storing extra layers such as waterproofs which could be grabbed quickly. front pouch ideal for quick access. The sternum strap has a whistle incorporated into the design. 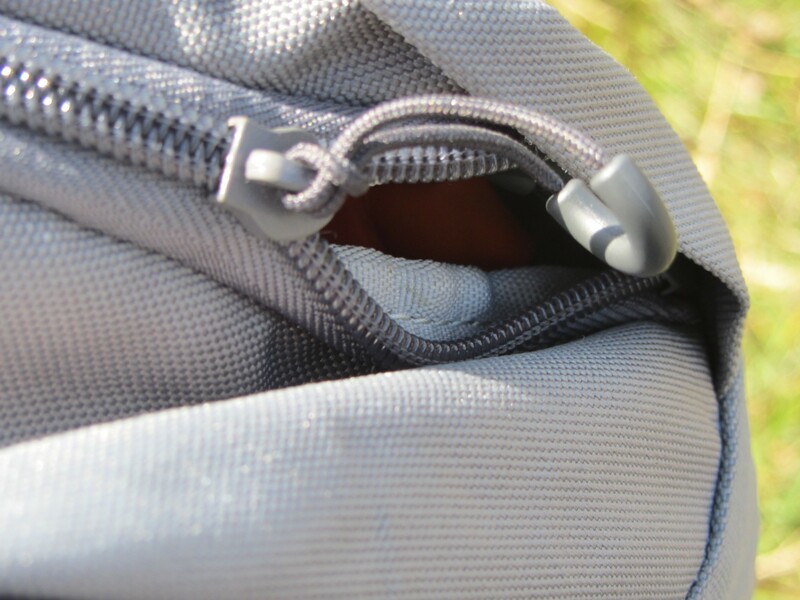 The Contour has a vented design which allows airflow to circulate around you’re back and makes for a comfortable. Fitted onto the back panel in the main compartment there is a mesh and zipped pocket, which I used to store any maps or documents which I needed to carry. 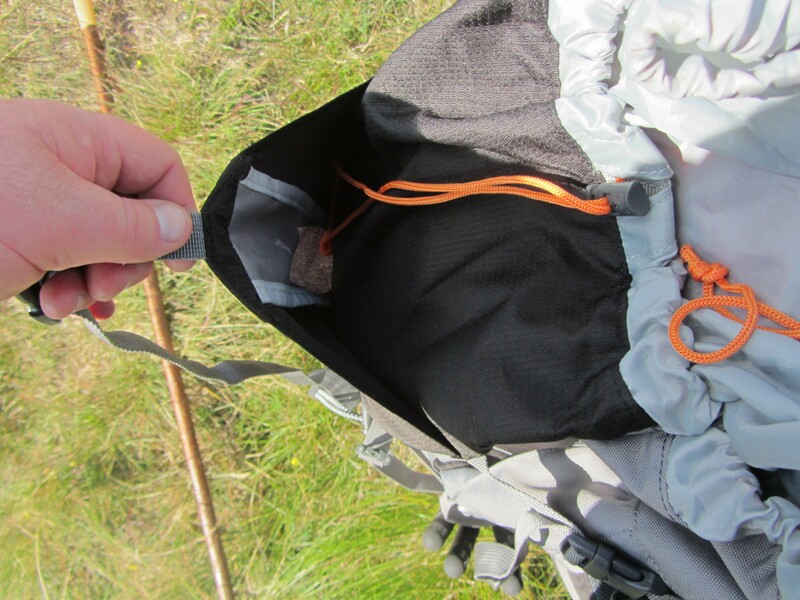 Located beneath the strapping on each side of the Contour are handy wand mesh pockets, which I’ve used to store items such as a water bottle or sun cream. The zipped base compartment makes it easier for you to get at you’re kit or create your own space by using the divider to split the main compartment into two. The Vango Contour 60 plus 10 is endorsed by the Duke of Edinburgh award scheme and recommended for expedition use, although a 50-litre pack would most likely be enough for a bronze award expedition. 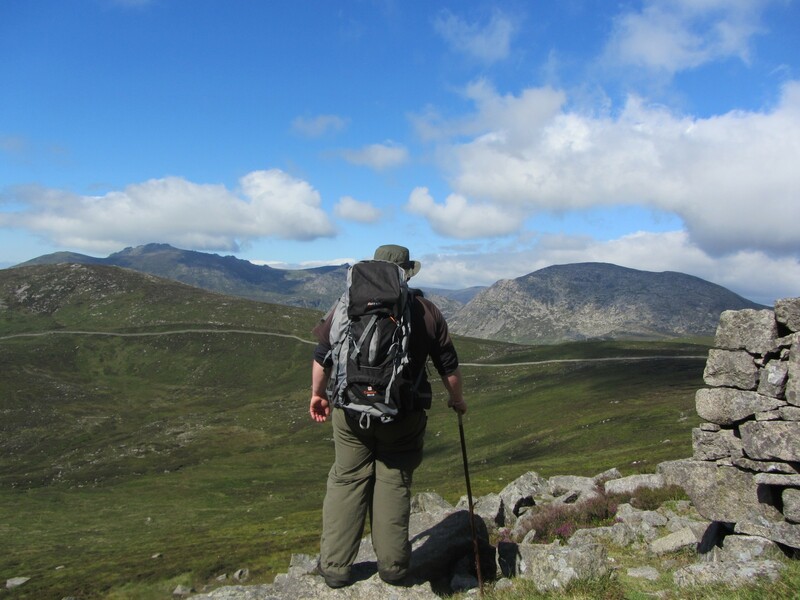 The contour is a large, well built rucksack at an affordable price. It has plenty of space and is comfortable to carry, even for extended periods. One slight fault I’ve encountered is the clip securing the sternum strap has came off a number of times but is an easy fix. 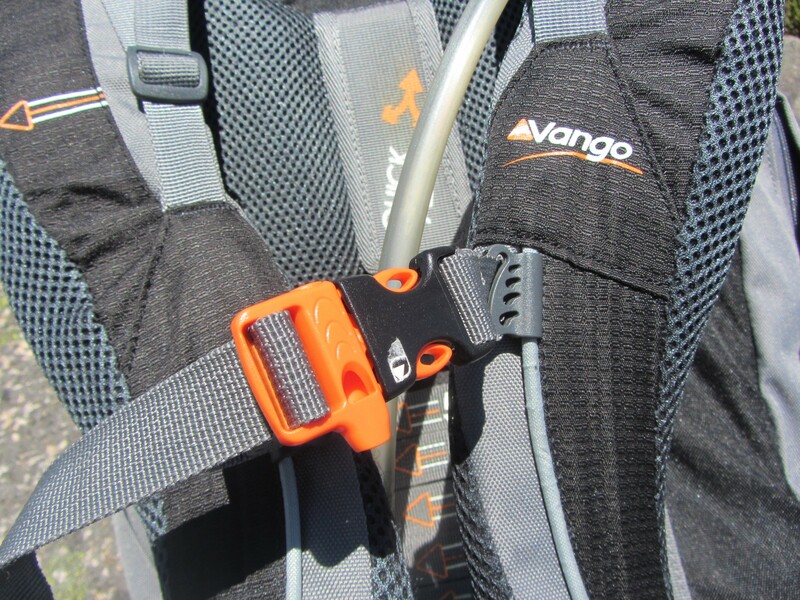 Given its affordability, features and adjustable back system I would be more than happy to use the Vango Contour. Its main drawback is its weight, which is similar to other similarly priced packs, but heavy compared to higher-end rucksacks. How do you fix the clip please as I am struggling to get it back on? I'd recommend softening the plastic a little by soaking it in hot (not boiling) water for a few minutes. Pinch the fabric where the clip goes on then slip the clip onto it. Then hold the clip shut for a while until the plastic cools and becomes less pliable. If it looks like the "runner" attachment point is torn or frayed you could try building it up a bit with duct tape or maybe even some silicone caulking so the clip has something to bite onto. Be careful not to deform the clip, it may already have irreversibly widened in which case I'd recommend contacting Vango customer service so they can send you out a new one. I always pack my sleeping mat inside the rucksack,suppose it depends on the model and size of the mat you use?